Well I learned this weekend, I’m a photographer fail. We are having some spectacular weather this weekend, so we decided to drive up to Lake Michigan to shop and drive around a bit. We stopped at a small beach and I took a couple of pictures. So this morning, I thought to myself “those pictures would be great for a blog article.” Nope, no, not at all….I must have been really distracted. 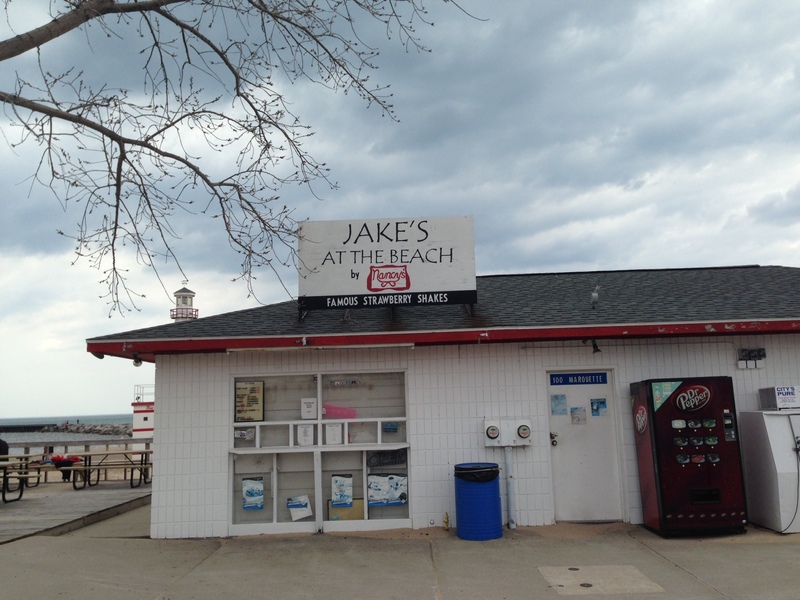 The reason we stopped was there was an ice cream shop on the beach called “Jake’s at the Beach”. Well, I have a Jake — so of course I needed a picture. There were three more pictures of the two of us — none of which I would put public anywhere. The last picture was of the actual beach, but you really can’t see it. Maybe it is time for me to take a class, or start scouring the world of the inner-webs to figure out how to take a good picture. We did have a great time. The temperature was in the mid-to-upper 70’s. This is my personal favorite range. We stopped at a couple of places along the way. There was a new Amish grocery store right off the highway on our way up. Next door, there was another young Amish couple who had a garden store. We bought some broccoli plants and will plant them in our garden later today. We went to the outlet mall, and shopped with all the Spring Breakers and their parents. I was going to get the cutest sandals for summer, but unfortunately the store’s cash registers crashed while we were in line. Oh well, it wasn’t meant to be. We managed to stop at both of our favorite restaurants in that area. Lunch at one and an adult beverage, chips and salsa at the other. My only complaint is because it is a bit early in spring, outdoor seating was not open yet. Definitely next time. The trip made us both decide, we are going to do this more often and next time no shopping, just the beach. Maybe even try one of those Strawberry Shakes.